Two months ago I visited Siargao and until now I still can’t move on. No days have passed without thinking when will I go back. I’m not sure why, but what I know is there’s something on the island that made me fall in love with it. Maybe it’s the waves, the people, the vibe. I can’t specifically point out what it is. Maybe the whole package the island can give. I don’t know. What I know for sure is that there’s a lot of things going on in this simple yet amazing island of Siargao. I know, I’m not telling you what exactly is on the island. Haha. But if you are curious enough. Go there and experience the magic! And if you decide to go. In that case, I can help you with that matter. I’m not a good planner and I’m not giving you any plan here. What I will share with you is our mistakes and the whole story of this adventure, also a few tips to make your Siargao experience worthwhile within four days! I will divide it into three. The Before, During and After. By Air – There’s only one way to get to Siargao via plane and we are lucky that we are currently living in Cebu. Cebu to Siargao – Flight are once a day and you can book it in cebupacificair.com . It is quite pricey so always watch out for promos as we did. Our tickets cost Php1300+ per person! It was really cheaper than the normal price. By Sea – Not the best choice but if you have a lot of time, you can go to Siargao via Ferry. Cebu to Surigao City – You can take Cokaliong Shipping Lines departs 7PM every day. It’s a 12-hour trip so it’s basically one whole night. The fare is Php850.00 for economy and Php1025.00 for tourist. Surigao to Siargao Island – There’s a daily trip from Surigao to Dapa. It will cost Php350.00 for a 3.5 hours trip. Well, like what they say, book ahead of time to avoid the hassle. If you are traveling with a group. I think the best way to look for accommodation is via Airbnb. (If you want to get Php950.00 Travel Credit book through this link) We got our place for only 1000 per night. With wide yard, 2 double-deck beds and 1 bed that can fit two people. With Comfort Room, Kitchen with complete cooking sets and a refrigerator. No complaints! Don’t forget to pack the need! If I can go back and repack, I will do it again. I don’t want you to regret like I did so I will share with you my new version of the packing list. Sorry boys. For girls only. Upon arrival in Siargao take a Van for Php150.00 going to General Luna. Remember always haggle. Sometimes the locals take the opportunity from travelers and charge fees more than usual. Be smart enough to know. Let’s have a checklist what to do on the first day! Here’s what we did. First. Rented a motorbike for Php350.00 a day. We had four days and to make our expenses less we had the initiative to calculate every bit of things. Every ride for motorbikes is Php20.00, so if you are willing to pay for every destination with that amount, then go. But if you won’t. Rent a motorbike. Second. Grocery shopping for four days. We ended up buying more than enough. So make sure to buy only what is needed. Third. Reserved a surfing lesson for the next day. Hashtag Excited. Well, we have to seize the day! After everything was set. We went to a secluded beach near the cemetery. Haha. It was nice because it was like we own the place. It was relaxing and we also saw a lot of jellyfish and we thought they sting, but actually don’t. After a long day. Here’s my TIP: Don’t drink in day 1! I repeat, do not drink! Maybe we are too overwhelmed to be in Siargao and decided to have some. But beware not to do this on the first day. You need that energy for tomorrow. Especially if you want to go surfing! Cheers to the first surfing experience on the island, but guess what? Because we had some fun last night we weren’t able to get up early at 5am, and went to our surfing session late. Boohoo! And because 9am is already not a good start to surf, especially for beginners, we ended up only having one hour to surf instead of two, because the wind was already blowing hard and beginners like us can’t keep up with that. I know. We already learned our lesson. The earlier the better. Is the most common spot for beginners. It is located on the left side if you are facing the boardwalk. Both spots are located near the Boardwalk. The places are a little bit crowded since it is popular. Quicksilver is for beginners and Cloudnine is for those who can surf on their own. But if you’re a beginner who wants to experience bigger waves. I’m not stopping you to try Cloudnine. TIP: If you brought a pair of reef shoes. That’s good! But if you didn’t. You can rent it for Php250.00 per day. Remember what I said earlier about renting a motorbike. This is the part you’ll thank me for that. Going to Magpopongko Tidal Pool cost Php1000-1500 per person. But if you rented a motorbike, the gasoline will only cost Php120.00 plus the cost of the motorbike per day! That’s a big difference if you’ll ask me. It is an hour’s drive away. Entrance Fee is only Php50.00. Ask the locals what is the best time to go. We went there at 12:00nn and the high tide is already coming. We only had an hour to enjoy the place. It was not really good time, but it was still worth it. On my next visit to Magpopongko I will make sure to be there at the right time. I know! We already rented a motorbike and I’m saying here rent a bike. This is for girls who can’t drive motorbikes. You can rent a bike for Php100.00 per day. We met a French guy who sells handicrafts for a living at the Boardwalk who is currently living in Siargao for two years! He really loves the place. He is a testimony that you should visit the island. Well, oh well. Another experience off my radar. Since I know that Siargao is a chill place. I never thought of going to bars or partying while visiting the island and yet I did! With my sleeping outfit, we went to Rumbar as it was the place to hang out during Mondays in Siargao. How did we get there? We ask the locals and pointed out this Bar. The place has a chill vibe with live music playing. Also, the drinks were good! On the next day, Tuesday is a dance party at Jungle! We weren’t able to party here since we went here too early and decided to hang out in another place instead. I forgot the name. I’m sorry. But it was near the boardwalk. The place has a billiards pool, dart and other group games like Jenga. UPDATE: Jungle is a jungle. HAHAHA. If you like that kind of party you should go then. Other places you can visit is Viento del Mar, Bravo, and Harana. This is the thing I am not good at but regretted not doing on the island. I only went to one café. A friend of mine suggested a lot like Shaka, Café Loca, Harana but I wasn’t able to go. So if you will be there, try to visit at least five. There are tons of Café there and I’m sure the food they served is amazing! Another place to visit is Kermit. We were able to dine in here. They serve Filipino-Italian Food. Which is authentic I must say. You can make your own pizza and the pasta was beyond my Filipino taste buds that’s why I can say that it’s authentic on the Italian side. Haha. Also, the restaurant is always full, they have reservations, but if you are not able to make any reservations as we did, just wait. It’s also quite pricey here. Ready your cash for the good food you are willing to spend on! Of course, if you don’t like to spend much, I have a place in mind. Go to Mama’s Grill. It was actually popular. A lot of travelers were in the place. No wonder, they serve delicious grilled food with affordable price. This is a must try! Bravo Restaurant – Delicious Spanish cuisine. And I love their Pomada drink! Yeah Yeah’s Tacos – Super affordable yummy tacos. Located beside Fat Lips Surf Shop. Barrel Bar Siargao – For late night cravings. Aventino’s Pizza – Cheap and Tasty Pizza. We underestimated this whole day activity and went on without any preparation at all. So I’m here to guide you to not neglect the most important thing during this activity. The FOOD! Prepare your food, buy a lot. Believe me, you will starve like we did if you won’t do this right. I’m not exaggerating this time. Also, rent the boat a day before this activity. If you will include Sohoton cove in your itinerary like we did it will cost Php4500.00. But if you will only go to the three Islands (Naked, Dako and Guyam). It is only Php1500.00. Going to Sohoton cove with a small motorboat takes two and a half hours! This is too long for five people with no breakfast going on an adventure. Also, this is the part of the island hopping that cost us a lot. Don’t blame us. Maybe we will visit the place once, and we wanted to enjoy every bit of it so we had to avail all the activities. TIP: If there are life jackets in your rented boat. Take those instead and ask to reduce environmental fee with safety gears. After the whole activity in Sohoton, we continue our island hopping trip. Since one of the machines in our motor boat broke down. It took us three hours to get to Naked Island, with no food to eat except banana. Starving, exhausted, and struggling for my survival, the only thing that came to my mind that time was I wished we had prepared enough food during that time. With no energy, we found civilization on Daku Island. Bought some food to eat before our lunch and ask the locals to cook our lunch that we brought back to the main island. At the moment the food was served and we were freakingly ready to eat our lunch. I was energized and ready to enjoy the rest of the day. Although we were ready to explore with my full tummy but sad to say that we weren’t able to visit this Island since we had no time left. But I will make sure to visit this island again on my next trip there and I will not include Sohoton to make that possible. Visited Siargao Island again and we went to Sugba Lagoon. A little information about Sugba Lagoon. It is located in Del Carmen, Surigao del Norte. The lagoon is hidden in a remote island surrounded with mangroves and beautiful islands with rock formation. It is said that the area is second largest mangrove system in the Philippines with more than 4200 hectares. I have a DIY Guide to Sugba Lagoon. If you like to go to places with less tourists, you should go on a road trip and discover new places. 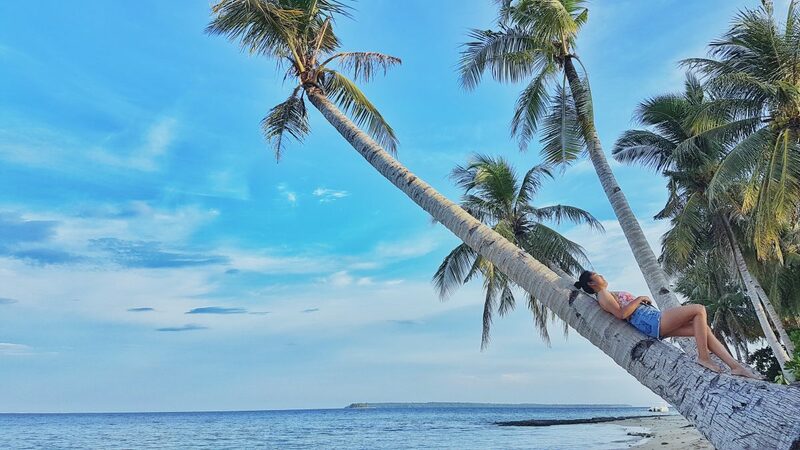 Siargao has been very popular and and a lot of things are going on in the area, especially in General Luna, and in case you want to escape that, a road trip in Siargao Island might be a good idea for you! You will get the hang on it. You will end up like me. The next day after our travel here. I’ve been searching about the place even more. Thinking when will be my next visit. Where to stay if I will not be in group. What food to try. What activities I haven’t done yet. And so on. And if you’ll end up like me. You will share you’re amazing moments in this island. Just like I did. Haven’t been here? Go and experience the magic with others! Share this post to your friends. Ganahan jud kaayo ko muari og Siargao but I’m looking for other stuff to do aside sa surfing since dili gyud ko kamao mulangoy. Ligo ligo lang siguro kog dagat. Magpa mermaid2x nalang kos daplin. Hahaha! There’s a lot to do in Siargao. The next trip I’ll do there would be my fourth trip and maybe I might stay for a month or for good. Haha. I’m also planning to go back. Siargao is such a beauty! When should you be back? Hi Roneth! May I ask where you rented bicycles? 🙂 Thank you so much! Pwede maka try og swim bisag di kabalo mulangoy? 😀 😀 😀 going there this June. Thanks so much for the great post! Siargao looks amazing and I will explore it in the next summer for sure. what if we have our own car? are we able to save that way instead? just to go round and everything so we dont have to rent scooter or car for a group.. How much roughly do you think Ill bring if im paying for 5 people? With a car, I think you can save a lot more. There’s a lot of activities in the island so your budget depends on what activity you’re going to try. Saan po pwde magbook ng bangka, aside from the one offered by the Hotel? Saan pwde pumunta para magbook a day before the Island hopping? Thanks a lot. Pwede kayong pumunta sa May boulevard or sa may Palengke sa General Luna. Maraming Bangka dun, pwede kayong magtanong sa mga bangkero.